As chemical engineers we love designing reactors. But a chemical R&D testing system is only as good as the process-control and data-acquisition system it has is. Robust automation makes the safe, unattended 24/7 operation of R&D units possible. 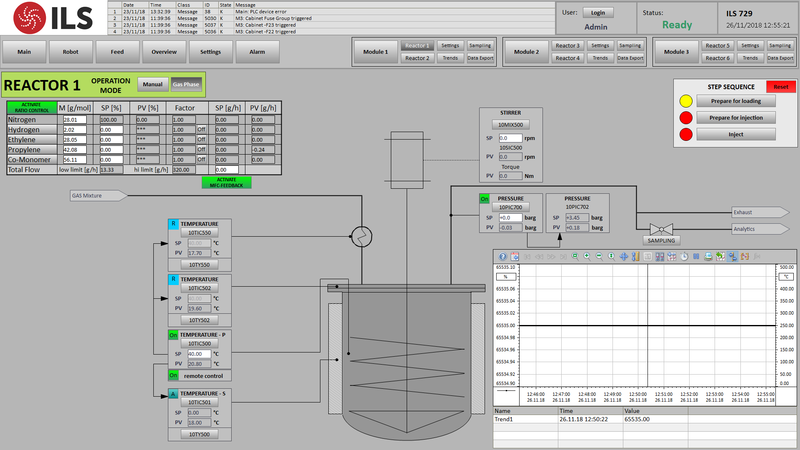 An intuitive user-interface designed by catalyst R&D experts, gives the researcher the luxury of focusing on data analysis and the generation of insightful process information rather than having to attend to the day-to-day operational work steps needed with manual or partially-automated units. The ILS Integrated Workflow Manager (IWM) is a powerful, Labview-based software tool, which ILS has developed over the course of many years. The IWM makes it possible to pre-program complex, multistep experimental recipes, which can then be executed with a simple mouse-click. 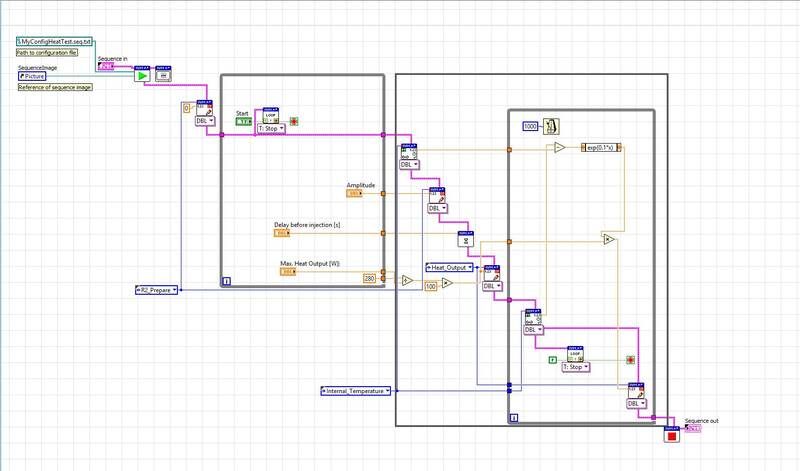 The Labview interface has the strength of offering all standard Labview functionality. The graphical programming approach used is extremely intuitive and makes it possible for different users to easily spot how experimental recipes are to be executed. This is far more intuitive and less prone to errors than using script- or Excel-macro-based systems. The IWM provides the ability to easily generate standard user “masks” as well for less-well-trained staff. These masks limit user input to only that necessary, minimizing complexity. Last-but-not-least, the IWM only communicates with the PLC via an OPC interface and presents no safety problems. It is impossible for the user to design an experiment that would design performance parameters, which have been already set by the PLC. Seamless integration of both on- and offline analytical data is a key element of fully-automated R&D units. This is particularly importnat for high-throughput units where significant amounts of data from a wide-variety of analytical techniques are used. The ILS analytical parser is a simple, yet powerful sofware tool which both triggers on–line analytical methods to execute analysis as well as reading in the data. 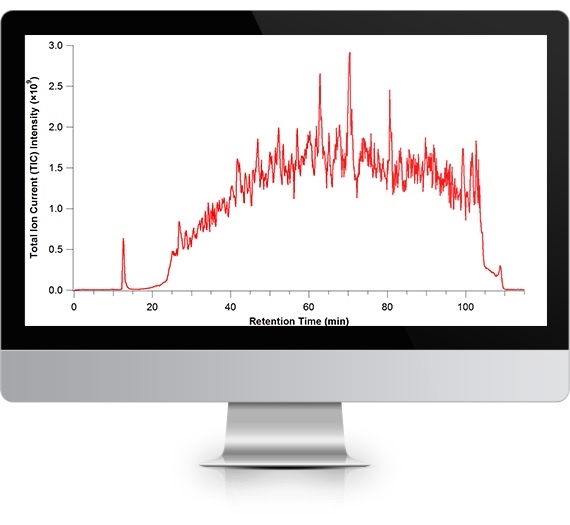 ILS has experience with both rapid, time-resolved techniques like mass-spectrometry or FTIR as well as slower techniques like GC and we are well-aware of the challenes of validating and combining the data generated by both with the process data generated by the testing unit. ILS often implements “intelligent” analysis software to make feedback control of devices like heaters or mass-flow controllers possible. An example of this can be seen in the screenshot to the left. 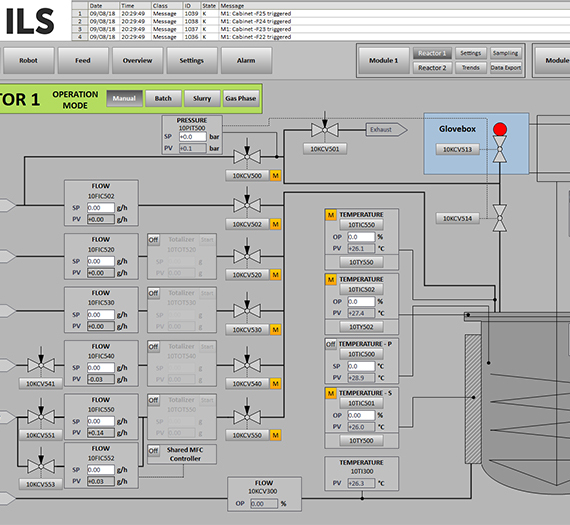 This is a screenshot of 1 of 6 reactors implemented in a high-throughput polyolefins unit where the gas-analysis from a Siemens Process GC is used in a closed feedback loop to control the mass-flow controllers feeding the reactors to insure a constant gas-phase composition.